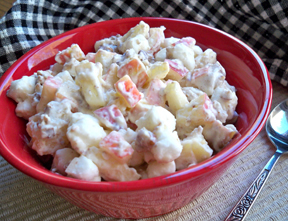 Simple salad with just apples and pineapple to give it a sweet fruity taste. 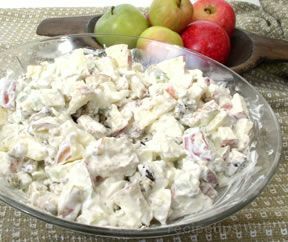 This is a nice make ahead salad with a creamy dressing sweetened by the mixture of whipping cream and marshmallows. Pour the cream over the marshmallows and set aside while preparing the apples. Add the apples, nuts, and pineapple; stir. Combine all the ingredients in a sauce pan. Over medium heat, cook until thick, stirring so it will not scorch. Let cool some then add vinegar and dash of salt. Pour sauce over fruit, stir well, and chill overnight. "Are you suppose to whip the cream before adding it to the marshmallows?" "Super fruit salad. 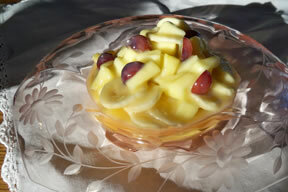 It only had apples and pineapple for fruit but it had a nice fresh flavor. When I first had it done it didn't seem to be sweet enough but after being refrigerated overnight it really sweetened up. 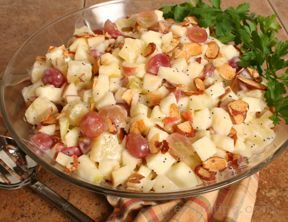 The nuts also added a boost of flavor and texture."